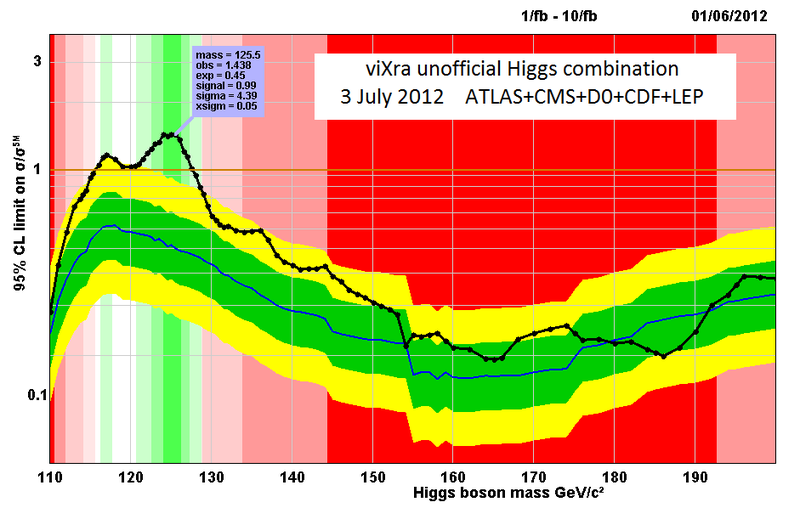 This entry was posted on Monday, July 2nd, 2012 at 3:05 pm and is filed under Higgs Hunting, Tevatron. You can follow any responses to this entry through the RSS 2.0 feed. Both comments and pings are currently closed. The width of the excess over the SM prediction in the combined Tevatron plot (from about 120 GeV to about 140 GeV) is surprising. The ATLAS and CMS exclusions rules out a Higgs for much of the range, but why is there such a strong excess beyond the SM prediction in the areas outside the exclusion range in the Tevatron data? IIRC, the Higgs boson ressonance width itself is supposed to be narrower than the W or Z because it has more mass. Is this a product of the lack of precision in the lower powered Tevatron and a bb channel that is less sensitive to Higgs boson mass than diphoton and four lepton channels that are driving the LHC search? Does the Tevatron data dampen speculations about fermiophobic Higgs? Also, what is up with the thin band of non-excluded mass around 118 GeV? Haven’t ATLAS and/or CMS excluded these? 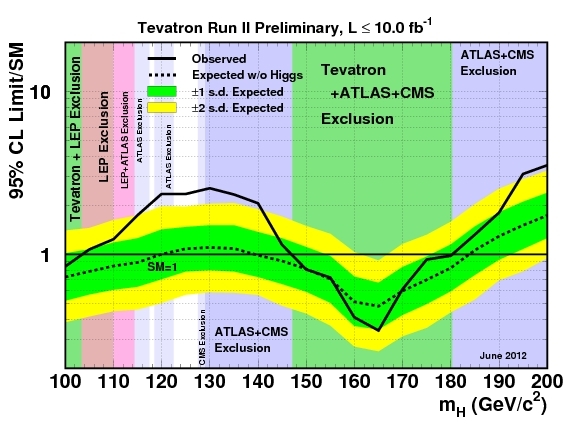 Does the updated Tevatron data add anything to the combined plot? Or does it really just provide some weak confirmation of the LHC result and perhaps some additional reassurance in a different channel that we are looking at a SM Higgs? Given how close we are to confirmation of a Higgs boson, it would be nice to see the data portrayed in a “SM less the Higgs” v. SM Higgs alternate hypothesis chart as opposed to only a comparison to a “SM less the Higgs” null hypothesis prediction. Can the Tevatron data from the bb channel be integrated with the LHC data in a way the shows whether the absolute production rates are comparable? Ohwilleke, the bbar decay channel has a mass resolution of about 15 GeV in the Tevatron, so around 125 GeV you expect an excess from about 110 GeV to about 140 GeV; it is not surprising to see it in theexclusion plot. Mass resolution is the key to answer your questions.